It's not that we were asked to make lemonade, far from it. But I couldn't help but think of a lemon. Not the cliche, but how a lemon elevates so many dishes and how it surprises you. You know when it is missing. Our goal was to design a lemon. A house that compliments the site in the most natural and unique way. A house that once you viewed the surrounding landscape from it, you feel cheated if it isn't from this place. Located on an unassuming street, the DO House is a simple box wrapped in a skin of old school Portland lap siding. From our simple lemon we cut out two wedges - one creating an entrance - the other interlocking the house with an impressive view of NW Portland and the Cascade Mountains. The plan is designed around a core stair that is accented by a continuous sinuous railing. A modernist pallet of white walls and walnut is incorporated thru out the house and accentuates the sublime interaction between the architecture and landscape. The ground floor is essentially one open room that merges onto a deck and view beyond while the second floor is a series of framed perspectives that engages this same view. Responding to limited street access and a cliff-side site, the residence is designed to make the most of its unique circumstances. A top floor living area, cantilevered over the entry, is enclosed on both the north and south facades by sliding glass walls that allow the space to open to the sun, breezes and distant views afforded by the site. The design strategy creates dual role spaces such as the carport/play area and living area that can unfold into a guest bedroom. It's also an incredible place to call home. We were asked to develop a few pieces of furniture based on some experiments we have been producing with wooden dowels and plaster. The designs create patterns and effects that are hidden below a surface. 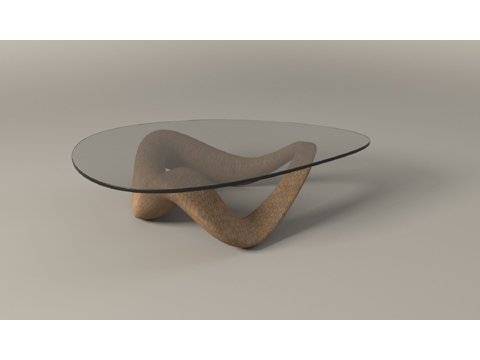 Our coffee table was inspired by images of Boa consrictors after they have had a nice big snack. The design is a single outline extruded and gently rotated as it moves around the table. The glass top is this outline and completes the table. A tight budget and extraordinary site resulted in this hybrid solution for the remodel and addition of a 1963 ranchburger. The new design allowed for what the existing house did not which is to invite the outside in. The interior ground floor is designed around an existing fireplace, while the new upper floor opens to the Marqaum Nature Park with a series of decks and large windows. 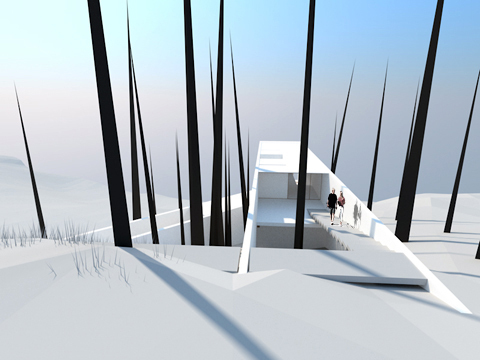 The abstract nature of the elevations is fashioned to start a dialogue with the surrounding forest. Our proposal for the Museum of Cartoon and Comic Art was informed by the abstract nature of this medium. Through the juxtaposition of words and images these artist make the obscure clear and the absurd funny. In the spirit of this art form we looked to find new meaning and understanding in everyday objects and nature. The design is structured around three "service" cores. Wrapped around these is an organic "served" envelope that is shaped by the sun as much as the surrounding neighborhood. The skin of our museum is made up of 3,082 copies of a single "light cone" (part skin, part glass), rotated on a single axis to create the illusion of a pattern. The building requires that you engage with it. It allows for an interpretation of reality which puts our understanding of it into a new focus. In this way, the museum speaks to the very essence of cartoons, interpreted through the lanquage of architecture. 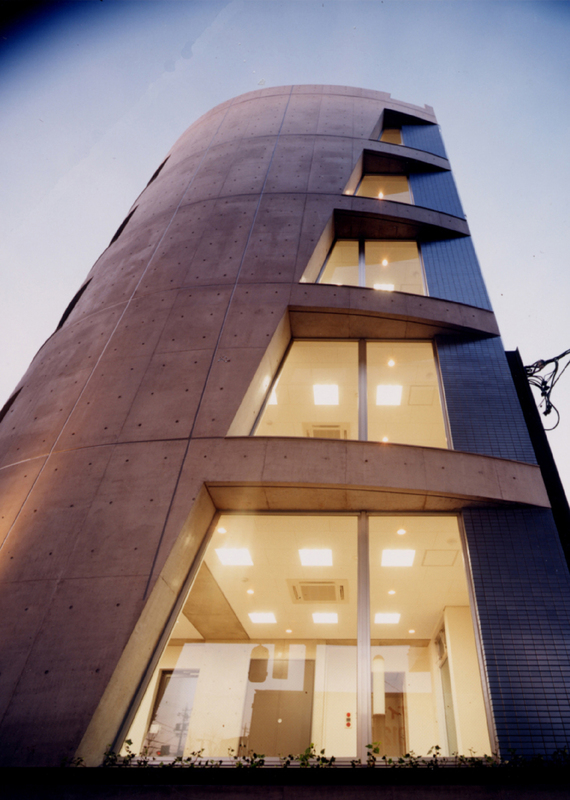 The design of the M/F House was driven by the desire to create an unique multifamily housing project that addresses the needs of a contemporary Japanese lifestyle. The concrete and glass design was "pulled apart" to allow for natural ventilation and lighting. private garden for the entire project. Located in the SW Hills, this residence has been modified over the years to an ambiguous state. With an ideal location and views, our job was to uncover what has been covered up over time. The scheme transforms what is now just a hallway to a new center of life for the owners. This new true living room fills the in-between space of the site and opens onto two new gardens. A formal Japanese garden, in conjunction with a new entrance, occupies one side of the site while a informal gathering space overlooks views to the mountains beyond. The new design becomes a livable link between two parts of the house that in the past have been pushed farther and farther apart. We got an e-mail inquiring about our plaster casts. Why?, what were they for?, . . . .
it also stated that they might be something of a muse for a turntable. Over the course of a couple of months we found ourselves designing something new yet familiar. A series of discussions led us to re-think the traditional concept of a turntable and instead focused on a idea that was informed by very tight parameters based on sound quality. The resulting design minimizes all potential vibrations and pulls the turntable apart to provide an optimal audio and visual experience. 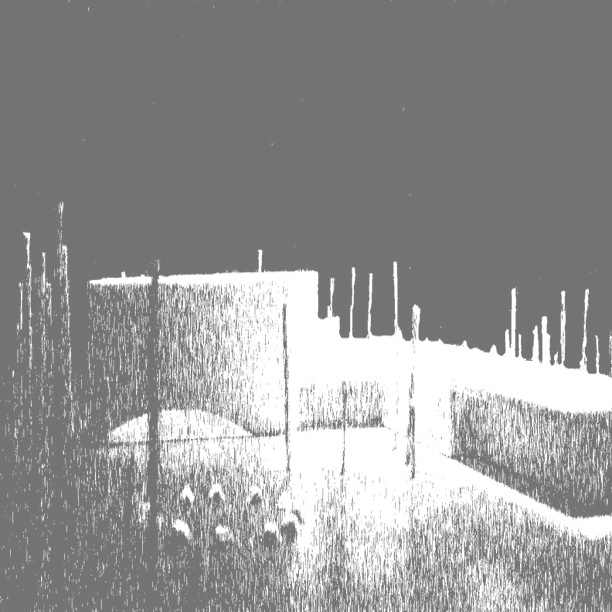 The AQ-R8 is computer milled from a single block of aluminum and comes to life at the conceptual intersection of two sound waves, perhaps infinite. The space where music comes to life. Our design for this 65 SM plumbing fixture showroom puts a twist on the clients desire for a "natural oasis" in which to display their products. 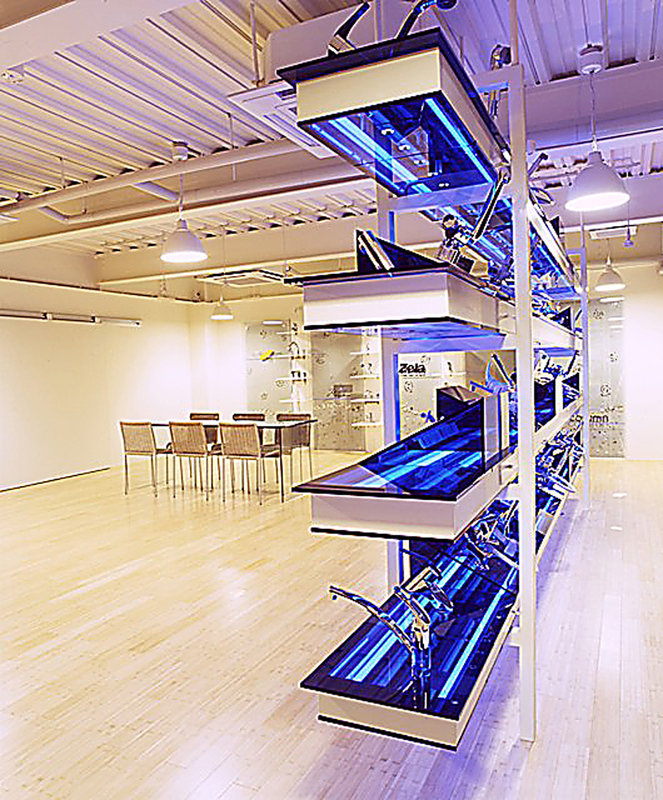 A swath of crushed stone, bamboo flooring, dried leaves and sea shells, while all natural, are used not in their lush, living state, but are employed in their driest and whitest form to create an arid space in which the blue acrylic shelving display "island" stands. A 4meter wide sliding door, complete with a sea shell weighted counter balance, connects the space to a 2nd floor sales office and a sense of motion and drama to the composition. Located in the sw hills of Portland, the owner of this house works and plays from home. The design is accented by four varying two story volumes that either create or define spaces within the house. The owner also talked passionately about the house engaging the landscape. The resulting design renders the volumes in a black stained cedar that abstracts the composition against the native planting and interacts with the atmospheric effects that surround this house as the seasons come and go. The design also places large openings onto the gardens and pool that diminish the boundaries from landscape to architecture. The Ohta office building is a very small building (think 4 parking spaces small) located next to an elevated superhighway. The challenge was to create an engaging image to pedestrians as well as automobile traffic yet minimize the noise of the highway while providing for natural light and views. A rear facing service block is rendered in metallic tile, while the office block is built of exposed, polished concrete to create a dynamic exterior image that clearly symbolizes the internal organization of the plan. A split piece of wood in our office finally spoke to us. Tokyo: One of the largest cities on the planet, an endless sea of lights. So much of everything that there is nothing – a desert. Traditional Kuwaiti architecture has always been confronted by two endless boundaries; the desert and the sea. This was the same challenge we faced. Our scheme uses traditional forms and patterns to create a simple expression that presents the nation of Kuwait to the hyper drive environment of Tokyo. The design is rendered in an 21st century glass skin that addresses the needed security and sustainability issues but more importantly reflected the vast changes that have occurred in Kuwait in the last century. The interior is grouped around a below grade vertical oasis, an inverted concept of the traditional courtyard house of the Middle East that contrast with the "dry" expression of the exterior and is a physical metaphor of this country's ability to flourish in the desert. 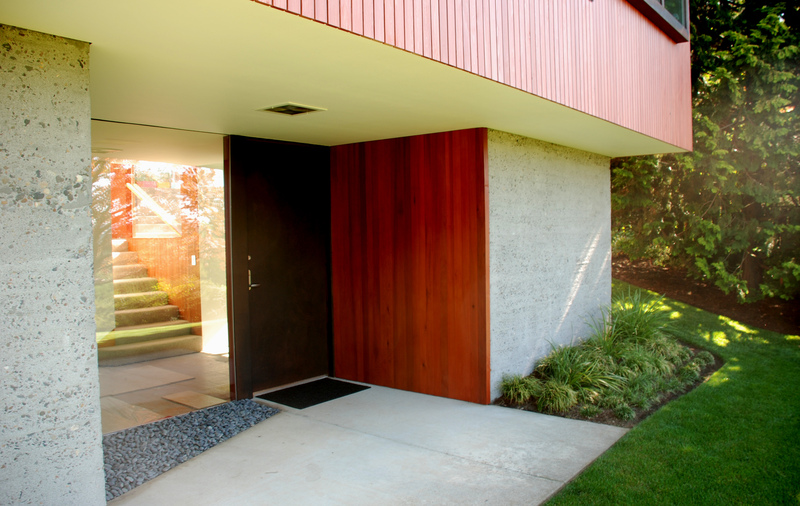 A meticulous renovation of a 1948 Warren Weber house. The project involves simple modifications to the original plan and complete update to the in-house pool. A clean palette of materials, landscape, and colors compliment the original design and is experienced by a series of perspectives that unfold as you move through the house. The 63-unit Izumi building is an exercise in simplicity. The units are designed to take advantage of views and natural ventilation. An exterior exit way is cleverly enclosed in a metal grated expression to create a recognizable presence on a very busy street. Unique forms, materials and imagery, combined with a variety of flexible floor plans have made these projects both design and commercial successes. Part of the 14 parcel experiment located in Portland OR, our scheme was explored and refined thru an exhaustive number of study models. The resulting design uses a series of simple shed roofs to create an "anonymous barn look" that can hold its on in this adventurous development. The ground floor opens onto a garden of cat tails while the upper floor is inwardly focused and accented with north facing skylights. The exterior is rendered in a polycarbonate skin that changes hues from purple to white depending on the ever changing Oregon sky. Otana tries to bring a sense of rigor to an otherwise chaotic neighborhood in Nagoya. A concrete frame steps up the hill and allows the site to shape and form the interior layout. A simple mix of wood accents and stainless steel trim help create a simple palette of materials creating a an elegant solution to what could have been just another condominium project. The stump house was an experiment. The client/builder wanted to create the most sustainable house available at the time. The house is heated by thermal tubes located on the "green" roof and employs an open design strategy that lets the house feel larger than it really is. Blue Jean insulation keeps the house warm and the basement can be rented out as an office.The client also went out of his way to employ as many local crafts people where possible. (i.e. metal work, hand crafted paper lamp by HiiH studio). The house ditched the idea of a front lawn in lieu of native drought tolerant plants and the back yard is designed around 3 raised planting beds. His idea was to create a modern sustainable house that got back to basics. Constantine's Arch in Rome has been described as "a matter of theater". The Romans understood the power of a symbol. By creating a "spectacle" we have designed an event, a place where people can come to exchange civic ideas. It is a gathering area, a sight to behold, and an experience to explore. Our proposal is an open canvas that pays tribute to the power of thought and creativity that has roots in Detroit. The spirit of Motown and the open road, symbols of the American dream, have always found a home in the limitless potential that permeates Detroit. The park asks to be explored, moved through, and experienced. It builds on the foundation of Detroit's industrial/manufacturing identity by suggesting a re-purposing of Detroit's thinning urban fabric. Constantine's Arch used the power of an architectural symbol to create a sense of collective identity and purpose. Our proposal taps into this quality of architecture. Instead of commemorating historical triumphs, our arch strives to connect a creative past with an unlimited future. 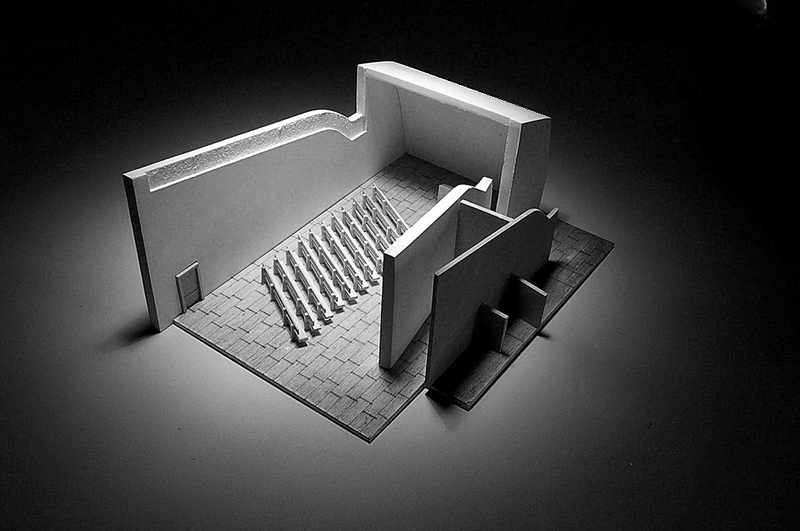 Our proposal for the Seattle Center started by studying the past. By analyzing Seattle's historic growth patterns and unknown factors such as peak oil and world population growth we began to ironically come to the conclusion that Seattle could be in need of the one thing that it has the most incredible view of - Nature. We noted that "scarcity" is one of the undefined qualities on the rise. The term is alarmingly pertinent to open space, to raw materials, to the ideas of access and availability, and most of all to our perception of place. Our scheme looked at the site’s original purpose: a place to gather. The design carves out a large new central plaza for the Center organized around a new Monorail/Restaurant center. The remaining site was re-envisioned as the forest it once was. One part is a living stand of Douglas Fir trees, a towering mixed-use “Wooden Forest”, a place for habitat and sculpture, and a true living-learning center. This forest is laid out on a grid pattern, an unnatural organization that renders it as a piece of living sculpture. The second component is a structured abstraction of the expansive forests that dominate the Puget Sound. Its random column grid references a true forest experience. This “Glass Forest” is covered with a combination of solar film units sloped towards the sun and a clear glass canopy - representing man's intervention into the Seattle landscape. A new underground exhibition space completes the composition. All of these systems work in harmony to extract clean energy from the site and weave a sculptural connectivity through the urban landscape; ultimately creating an environment to support the many events that bring the center to life and keep looking to the future. At 400’long, the UT School of Art and Architecture introduced a new vocabulary to the University. Designed around a conceptual interior “street”, the concrete and glass school embraced a more modern language and technology. Our project reinterprets this attitude and “street” concept. The scheme extracts DNA from the original architecture building and combines it with newer technologies and materials. 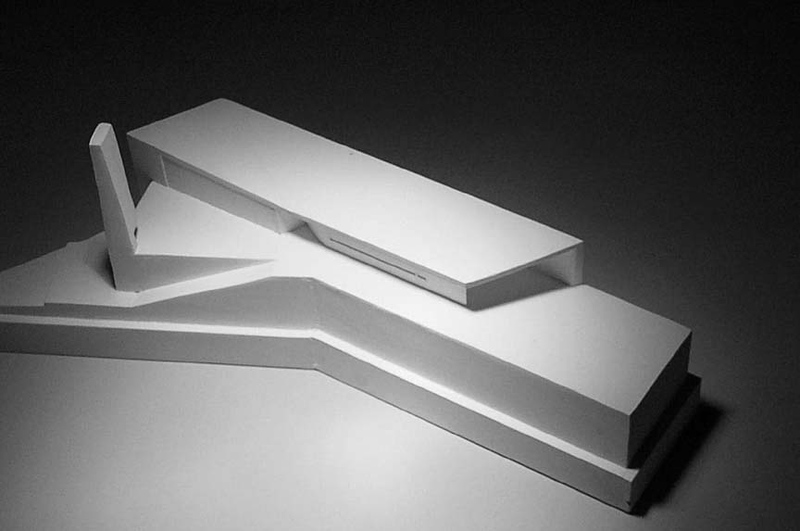 The concept is literally bent and contorted to fit within its’ new site. A 2-layer ETF inflated structure rises from the courtyard, establishing an assembly space that at times seems natural, at other times unavoidable. Through a rational exploitation of this material’s unique qualities the exterior skin references the traditional (brick) campus architecture with pattern and color. Concrete is replaced by air pressure and the distinction between solid and void, inside and out is blurred to create an assembly space that requires minimal energy and material input. The new composition is as much about architecture as it is about sculpture and the landscape. Orange Alley re- introduces new technologies and form making to the university and reaffirms that this is a place where architects and artist assemble. Located in the Blue Mountains of eastern Oregon the house is situated on an overlook near a small mountain lake. The design inserts an "A-frame" design into the hillside to create a conversation between the angularity of the two conditions - architecture and landscape. The front "A" creates and unique viewport onto the nearby lake while another inverted "V" skylight is inserted near the middle of house to bring natural light into the house and accentuate the interior stairs. Our "A" frame is slightly off center to allow for one side of the house to be fitted with solar panels and capitalizes on the efficient nature of an A-frame to allow the house to be built with 20% less lumber than a typ. home of this size. The house sits in stark contrast to its nearby neighbors but more importantly strives to rise to the special uniqueness that is the Blue mountains. 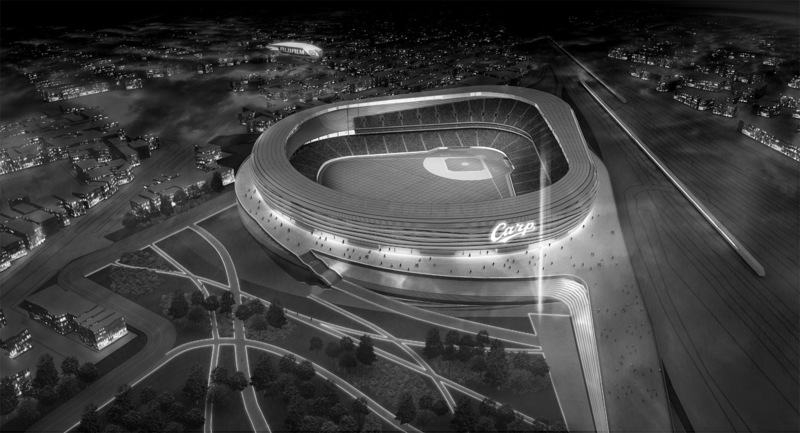 Our proposal for this 30,000 seat, open air baseball stadium, designed in collaboration with ArupSports, Atelier Dreiseitl, and Ziba, explores the synergy between a state of the art sports facility and substantial hotel, restaurant and office components that surround the actual playing field. It was a great beginning. A beautiful wooded site with the desire for a new house. Then there was a discussion about "clearing the site" to make room for said house. We saw incredible beauty in the existing site and went back to work to find a way in which to preserve as much as possible and still find room for an incredible new home. After a number site studies we began to explore the design thru topographical art pieces and abstract plaster models. These studies eventually revealed an unconventional yet evocative scheme that positioned the house to take advantage of views and sunlight and simultaneously preserve the natural state of the site. The new design stacks two bars using the slope of the site to create new outdoor gardens and spaces. The new house exposes and uses the natural terrain and trees to become an integral part of the composition and architecture - so much so, that the two cannot exist apart. The b0x house started with this simple request. The resulting design expresses these somewhat contradictory emotions by proposing two separate structural systems to remedy this challenge. The lower floors are delineated by an exposed concrete structure that frames various views into the nearby forest and lawn. The upper floor is a wood structure that is clad in a cedar siding. The resulting composition creates a situation that is at once open and closed and maintains a very abstract form to arouse the intense feeling of nature that often encompasses it. Situated atop a small wooden forest, this chapel celebrates the cycles of life. You could feel God in the silence of the trees on this site. The design strategy incorporated clearstory lighting to accent the alter, while folding doors open and expand the chapel to the forest beyond. The relationship between the building and natural surroundings is meant to bring the presence of God into the service and creates a space in which people sense their own "smallness". The design uses tilt-up concrete construction and minimizes openings to create a simple design within a modest budget. Located about an hours drive from Portland, this home sits in the rolling wheat fields of central Oregon with majestic views of the Cascade Range. The project takes its inspiration from the ever changing “folds” between these fields. 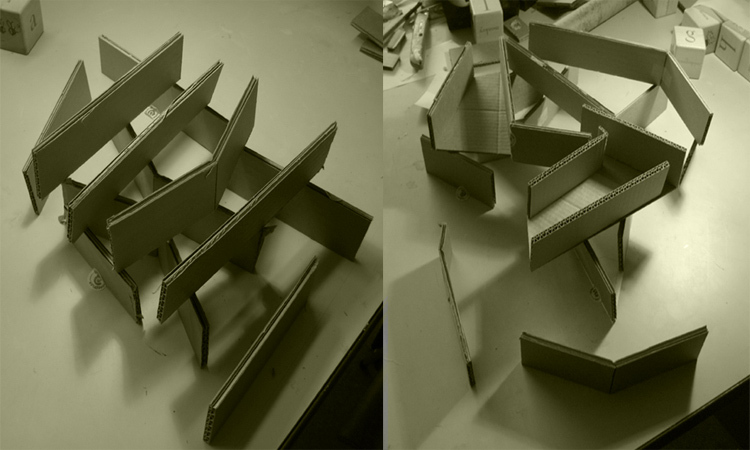 The designs’ bent plan and folded roof optimize and frame specific views from this site. Clad in wood shingles, the house changes “luminosity” depending on the seasonal patterns of the wheat fields maturing from green to yellow and back to the dark brown of the soil. Our proposal for the Memorial Colosseum is simple. Turn the building inside out and breathe new life back into the most incredible view from a sporting complex anywhere. Our scheme surrounds the Stadium with a series of athletic fields that will create the country's first urban sport center dedicated to both professional and amateur athletes. A new housing development compliments the existing water walkway and creates Portland's own Olympic Village. The Memorial Urban Sports Center (MUSiC) recalls the sites historical past rooted in Jazz music and creates a communal place where the best of Portland's athletes can show their stuff. Our scheme for the Flemington Jewish Center Competition evolved through a series of monotype prints exploring abstract compositions of “Groupings of faith.” At the heart of the project is the sanctuary, accented by a series of 15’ deep skylights producing an evenly diffused quality of light that changes intensity throughout the day. An arced window provides an aperture to view into the garden and allows the ever-changing mystery of God’s natural universe to be an important part project. The relationship between the architectural spaces and Garden of Hope and Twelve Stones is meant to provide a physical representation of the spiritual relationship between God and man, a symbolic gesture of faith. Groupings of Faith is designed to create an enriching environment for all its members and architecturally represent the commitment that has been made by FJC to its congregation and the local community. The House of Cards was influenced by Eleanor Raymond’s modernist explorations of material and landscape. The HOC uses structural solid wood panels, one of the most renewable materials taking the least amount of energy to produce, to provide the interior and exterior finish, moisture protection, insulation, and structure. Stacking the panels organically, the concept frames views into the landscape or bends the panels onto themselves, reaching out to enclose portions of the landscape while embracing the interplay of shadow and light. With no distinction between interior or exterior walls, the design strategy allows creative interpretation of space, volume, and architectural expression while incorporating passive strategies of cross ventilation, shade, and thermal mass. The frozen Red and Assinboine Rivers is one Canada’s most unique public spaces. Reflective of the spirit inherent in this northern landscape, the site is created by an act of nature and alive for only a season. Our proposal was inspired by the great history of Canada, from its past to its present. The form recalls the structures of the first nation peoples while its orginazation promotes a shelter for chance meetings, a place to reflect, and provides shelter from the wind and cold. A double layer of recyclable-wind proof fabric provides a soft diffused light on the interior and the dark exterior fabric uses the sun to naturally warm the space. 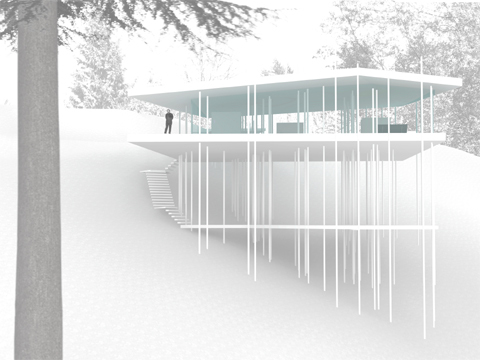 Additionally, the design frames a series of views onto the frozen river, recognizing and respecting the beauty of this winter landscape. We have an ongoing conversation in our office about the proliferation of computer programs available to architects and designers. Are they enabling our creativity or clouding our critical thinking? We aren’t sure. 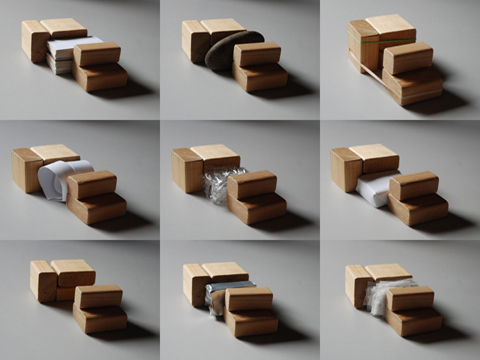 Our recent proposal for an installation in a gallery in NYC gave us a chance to think out loud. The Hills of SW Portland are littered with strange beasts. Typical homes propped up on stilts to accommodate their unique position on a sloped site. A weird mullet type of condition where the front and back of the house no longer talk the same language. We had the opportunity to re-interpret this condition with a design for a new home in the hills. Our scheme draws on the unique history of houses on stilts from many early modern masters and creates a design centered around a array of small seemingly randomly spaced thin columns. These columns create a manmade forest that define rooms and spaces and engage the visual dynamic of the forest. The new planning scheme is then merged with a simple NW housing vocabulary. The house becomes a series of planes that now "live" and grow out of this hillside. The interior plan is defined by a number of movable curtains that can be drawn close, partially open or open to delineate any combination of room(s). The strategy takes advantage of the house's lofty position and ability to have full exposure to the nearby forest and creates a new hybrid typology and living condition. architecturew was founded in 2001 by partners Michel Weenick and Brian White. Known for their simple yet engaging designs, the studio is founded on the pursuit of quality, craft and a belief that the art in architecture plays an important role in the quality of our collective lives. There is a deep and embedded history with nature in the cultures of Japan and the Pacific Northwest. Through our offices in Nagoya and Portland, our studio explores the relationship between nature and architecture - explorations of space, light and landscape. By listening to our client’s visions, architecture w creates solutions that emerge from a complete understanding of the project’s circumstances – the particulars of climate, topography, program, and local culture. All of our works demonstrate a common exploration for the memorable element of space and optimism inherent in every project. Brian White, AIA, received an undergraduate degree from the University of Tennessee and a Master's of Architecture from Washington University in St. Louis. He has also studied abroad in Europe and South America. Brian worked for firms in San Francisco, St. Louis, and Portland before starting his own practice in 1999. He has taught at the University of North Carolina, Charlotte, and the University of Oregon. Brian is a member of the AIA and a registered Architect in Oregon and California and is NCARB certified. Michel Weenick AIA, opened NGO Architecture in Nagoya, Japan in 1994. This Japanese 1st Class licensed office has successfully completed numerous residential, office and retail projects of various scales throughout Japan and is now part of architecturew. Michel graduated with a Bachelor of Architecture from the University of Texas in 1987 and is registered in the State of California, a member of the AIA and NCARB certified. In addition to his professional responsibilities, Michel serves as a Vice President of the Chubu Chapter of the American Chamber of Commerce Japan, a trustee of the Nagoya International School and has lectured at numerous universities and symposiums. architecture w has received numerous design awards for our work, including an AIA honor award for the m house and an AIA Merit award, and Smile Aichi Housing award for the M/F house. We were also fortunate enough to receive one of the rare Root awards for the Stump House. Architectural Record, NYT, Azure, Dwell, Western Interiors, Portland Monthly, 'Sumai-no-hon' (Book of Living) Magazine, 'Kenchiku Journal' and Otis.